As much as I would love to have categories of images for every food known to man, I’m just one gal working alone to share images with other crafters. When enough images of a similar kind are added, I create new categories for them. But, when there’s only one or two of something, it just doesn’t make sense to put them alone. This category showcases mixed food images. These tasty food items run the gamut from grains to pies to bread and all sorts of other food items. Hopefully, there’s something here to tempt your artistic side and will be just the thing you need to complete your project. 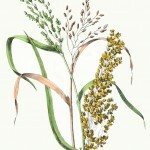 Vintage grain botanical print of rice and millet. 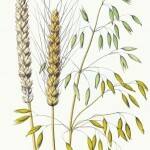 Colored drawing of oat and two types of wheat. 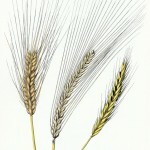 Vintage drawing of sprigs of bere, barley and rye. 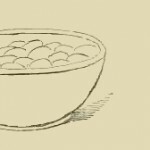 Simple sketch of a bowl of eggs and a soft-boiled egg. 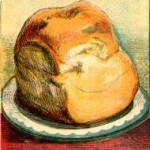 A loaf of bread sits on a plate in this vintage food drawing. 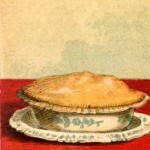 Vintage image that looks like pie clip art. 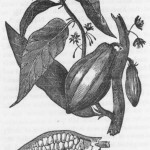 Black and white drawing of the cocoa plant and fruit. 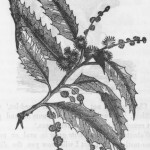 Vintage black and white drawing of a chestnut branch. 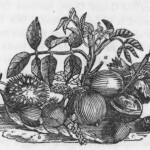 Vintage black and white drawing of chestnuts, hazel nuts and walnuts. Block print style drawing of a table full of food.